Not knowing what I am doing never stops me, it just slows me down a bit. 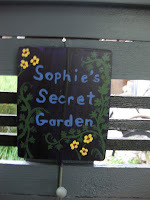 When my daughter told me my granddaughter was reading The Secret Garden I decided she needed to have a Secret Garden. A real walled garden of grand proportions! Except that there is no room here for a grand garden and no walled space. I did, however, have a side yard, done as a very low water needs area some years ago. Nothing very special there but it had the house on one side, a short wrought iron fence on the other and a six foot tall section of fence at the back end. Sounded as if, with the addition of a gate, it could be Secret Garden-ish. The first thing I did was install gate posts. Now some would say it would be smart to have the gate in hand and be able to see how things would work but I decided to just start and hope for the best. I dug holes and put the posts in concrete. Did you know there are level apps on smart phones? When I couldn't find my level I searched and there they were. Worked great too! I couldn't have found a better gate! I went off to Home Depot, looking for wood to make a gate. Someone took pity on me and my naivete because right on the end of the lumber aisle sat the perfect gate. Meant to be used as a short fence piece to hide an air conditioner or garbage cans, at four feet it was exactly the height I had hope to make. It also had trim that coordinated with the nearby arbor I installed to replace the one the wind took out a while ago. A few coats of paint and it was ready to go. Hinges were added and a latch was installed that can be reached easily by a five-year-old. The sign up there at the top was painted and hung on the gate. My old garden bench, replaced by a new birthday gift bench, was relocated here. A circle of river pebbles was surrounded by 3" grapevine ribbon, staked by landscape cloth staples, to make a little fence. Sophie arrived for a visit sooner than I had expected when I started this project so things were not quite done. A fairy cottage must be made; it will be much smaller that the first Fairy House. The liriope that has gotten out of hand must be reined in. More hardy plants that appeal to five year olds must be added. But there is no hurry. We planted a few things on the last visit. More will be added in due time. 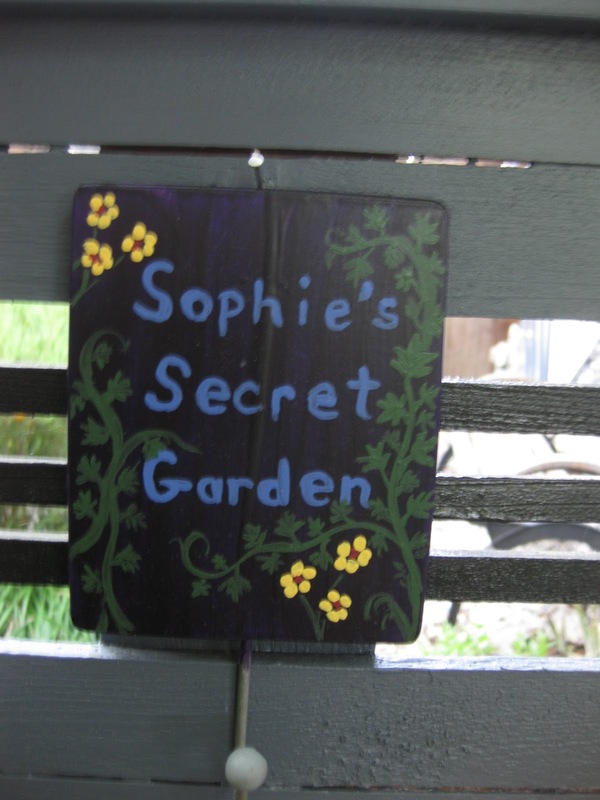 The one thing Sophie made me change right away was to take the sign off the gate and hang it in the garden. As she so astutely put it, it wouldn't be a Secret Garden if it had a sign on the gate. It's so perfect it brings tears to my eyes, Leslie! Sophie is indeed smart. Secret Gardens need to be kept hidden, or at least not have a sign! HA I am interested in that little grapevine edging, thanks for yet more inspiration. While this space may seem small to you, it probably looks just fine to little Sophie and her brother, Nate. Great idea and a great way to start the little ones on a path of nature love. A magical place for a little girl to create and dream! Way to go, Nonna! You are amazing! It sounds perfect. Is Sophie going to help build the cottage? And don't forget to let Mr. Nate poke a few plants into the ground (with Sophie's permission). Sophie is right. Can't have a secret garden with a big sign on it. 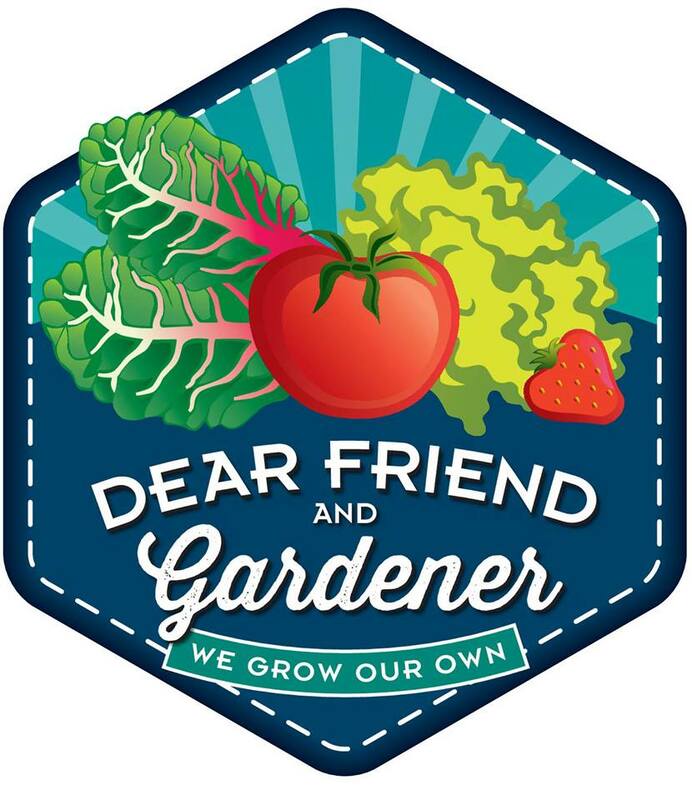 You will have so much in this garden with both of them. 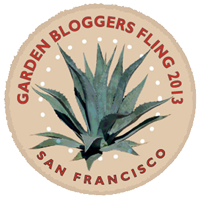 I love secret gardens so much I have made one for myself in every place we have lived. I am glad you are making one for Sophie. Why are kids so smart?? Garden sign was such an obvious no,no. I've always believed that everyone should have a secret garden, even if it's just a favorite chair in a favorite corner of the yard.